The Engagement Cycle helps organisations undertake meaningful patient and public engagement for maximum impact. It is a tried and tested, practical resource, used by dozens of Clinical Commissioning Groups (and others) to plan, design and deliver great services for, and with, local people. 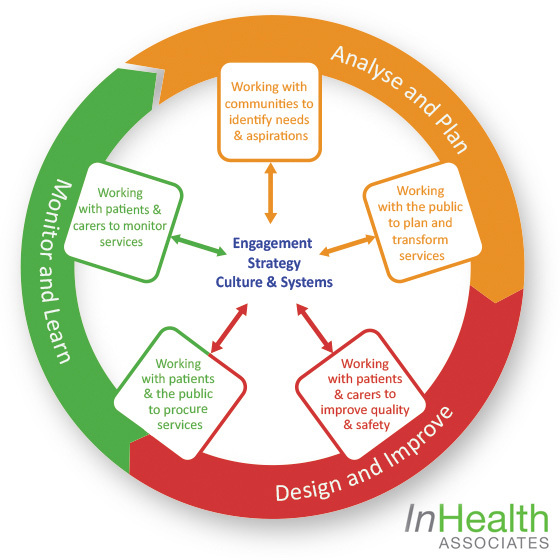 This new version of the Engagement Cycle has been developed by InHealth Associates. It has been updated to align with current statutory guidance, new commissioning arrangements and current healthcare challenges. We can provide additional resources that will help you use the Engagement Cycle more effectively. These include policy and practice guidance, practical tools and templates to aid implementation and links to useful organisations and case studies. Development of tools and products, for example on gathering and using data, self-assessment and monitoring frameworks, metrics and evaluation. The way we work models effective engagement – see here for more on our values. We hope you find this resource useful. Let us know how you get on. The engagement cycle is now maintained under the Creative Commons Licence (for more information please follow relevant links below). If you would like to use any of the content please contact the main contributor at InHealth Associates for permission and to let us know what you would like to do with it. Thank you in advance for adhering to our policies.